Well 2018 is certainly racing away with itself and here we are at the end of May already and that means it’s time for another Art Elements theme challenge. 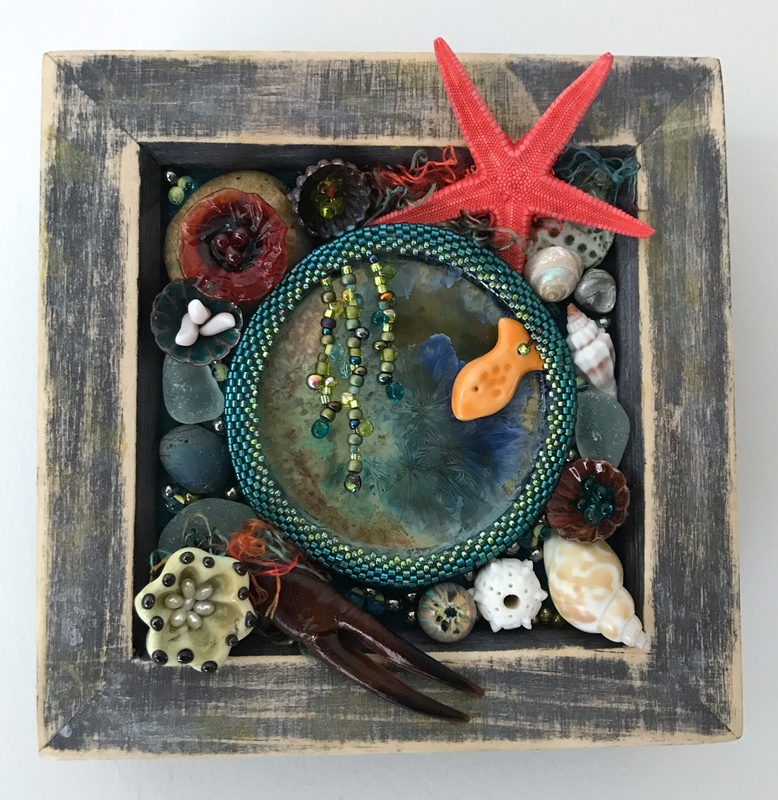 I have the privilege of hosting this month’s challenge and when I decided on Tide Pools as the theme I had an image in my head of a big textile piece full of colour and texture and covered in lots of beach finds. Then I blinked and found myself left with only two days before the reveal and nothing started yet…why does life do that so often? It can’t be anything to do with my (lack of) organisation can it. Anyway, I had to downscale my plans and started by pulling out art beads and looking for anything suitable for the subject. I could have spent half a day on this but since after just five minutes I had a tray full I decided it was probably best to stop there. Even just going through this little lot I was struggling to make my mind up and I kept pulling things out and putting them back – and that’s before I even got to my stash of beach finds! In the end I kept being drawn back to this crystaline ceramic cabochon by Minori Thorpe which already looks like a miniature pool. It’s quite large and has a lip to it so I’ve struggle in the past to know what to do with it but it seemed to be purpose made for this project. 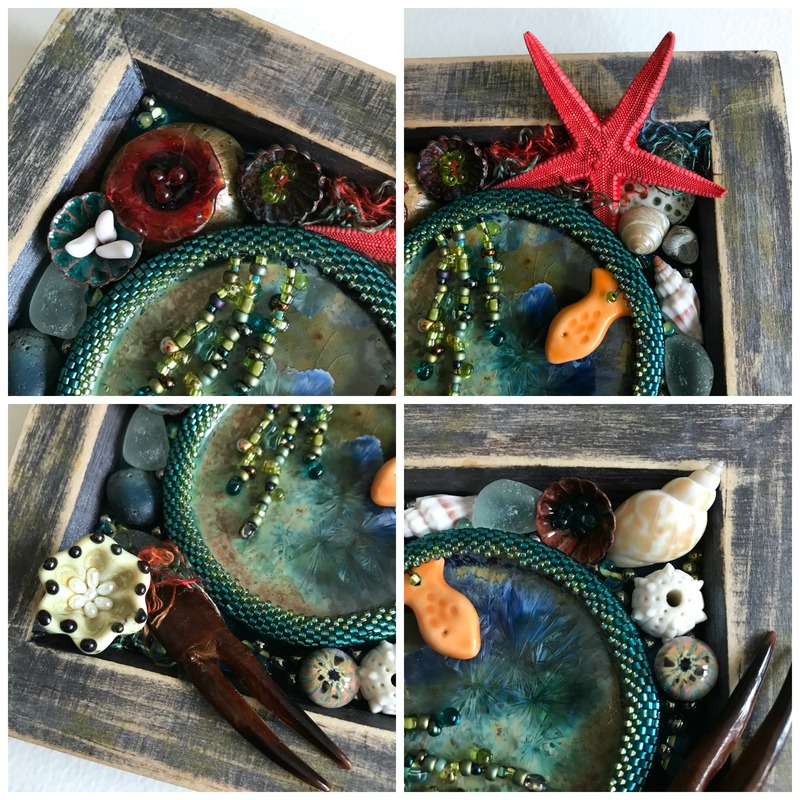 My plan was to create a decorative piece around the bead embroidered cabochon set in a shadow box frame so I started by staining a box frame with a mottled greyish paint mix to represent the rocks around the pool. I always sand my painted frames back and this gave it a bit of a driftwood effect so it works that way too. 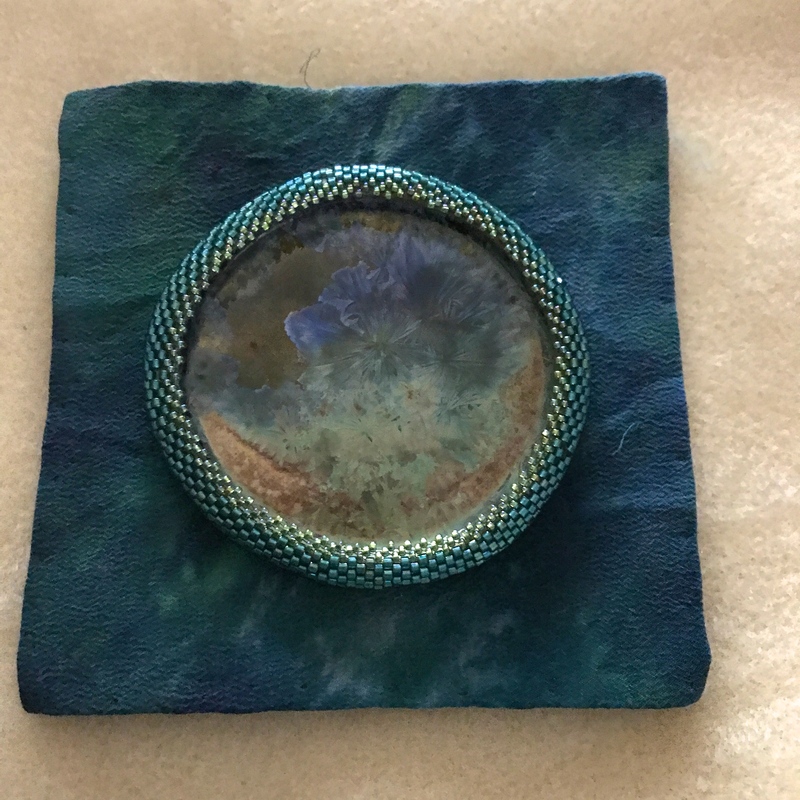 Once that was done I covered some bead backing with some silk fabric and beaded a bezel around the cabochon to create the centre piece – so far so good. From there-on-in it became a bit like a jigsaw puzzle as I selected various beads and components and played around to see what would fit where. This took quite some time and I had to fix a few pieces at a time and then go back and check the rest would still fit. I stitched as many items as I could in place but some, inevitably had to be glued. In the end there wasn’t much of the silk backing visible and I filled in some of the gaps with Czech glass drops to give the impression of bubbles and used drops and seed beads to create some seaweed fringing. Unfortunately it was difficult to get a really good photo because of all the different angles and the depth of the shadow box frame. I took a few close ups to try and give a better idea of the various techniques I’ve used. This piece includes glass, ceramic and enamel components made by my team mates Jenny, Caroline, Sue, Jennifer and Karen. The shells and sea glass are mostly local and the crab claw came all the way from Fenwick beach in Delaware and as for that lovely star fish… I’m not sure where he came from but I suspect he was purchased rather than found. So that’s my finished piece and I’m pretty happy with it considering I set myself up for such a rush job. Now I can’t wait to see what everyone has been inspired to create (don’t forget one of our guest contributors will be randomly selected to receive a goody bag from me) and I hope you will join me on our blog hop using the links below. Previous Art Elements Theme Challenge – Horses. Lesley, there is so much of interest in your piece, I love the beaded rock pool with the fish. I think I could spend all day looking at your creation and finding new treasures and intricate assembly details to admire. I can’t believe it took you less than 2 days to put all that together. It’s lovely. I agree, there are so many treasures to be found in your piece. I love how you treated your frame, and the cabochon and all the added details, it’s so rich! Thanks for picking such a great theme! Wow! For someone who waited until there was only 2 days left you created a masterpiece. I love that center cabochon-it really was perfect for this theme. I am sure you had fun picking and choosing all the other little elements to tuck in around it. I love the pop of color from the little goldfish and the bright red starfish! Thank you for choosing this theme. Love it! For a “rush job” that is fantastic! I love the colors and textures and can appreciate each thoughtful placement. It makes me want to touch it thru my screen, lol! Gorgeous work! First off, thank you for such a wide encompassing and inspiring theme this month!!! I can’t say enough good things about how you pulled together these pieces into a whole finished work! I love the ‘distressed’ look of the shadow box frame, the centerpiece that started it all was just WAITING for this project for sure. I enjoy all the textures and elements hidden in the frame and loved the backing even though little of it is seen in between. The dangling beads are one of my favorite additions as well. You have a great eye for layout and color work, something I am hoping to improve on myself, so thank you for sharing your creative talents!! I love the theme you selected for this month. Thank you! Your piece of art is so special and beautiful. I live just down the road from Fenwick Island in Lewes, Delaware. I was stocked to read where your claw came from. Very cool! This is perfect. I love all the layers and depth and the way my eye moves across the piece. I started mine at the last moment myself, so I’m even more blown away by what you managed to do in that time! Such a sweet tide pool, such wonderful work! Your crystaline ceramic cabochon was made for this challenge! Perfect! Love the way your tidal pool came together. Great theme I enjoyed participating. What a really beautiful piece Leslie, I love what you did with the frame and how you beaded around the edge of the cab and the sea weed is a great touch. It looks like a treasure trove of beautiful things! I agree with the others, that your rush job came out beautifully. Sometimes I wonder if we actually get more creative when in a crunch! I like what you did with your cabochon, very fitting. Oh that trip to Fenwick – what the ocean wants to give the black flies drive away… I love it. I love the composition, crowded and clustered as things get swept up and deposited by the tide. (I am sure that color starfish is “enhanced” lol) I will show Minori next time I see her! I really like the fiber tendrils sewn in here and there – great texture ! I think you’re right about the star fish it is a bit ‘radio-active’! Fantastic tide pool art! 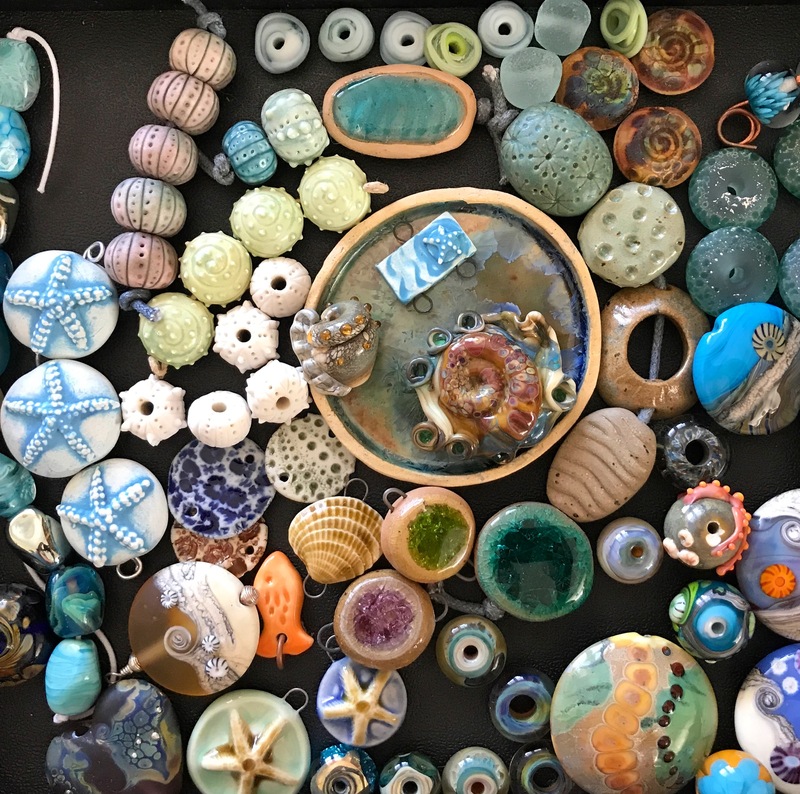 I thought the main ceramic bead was extraordinary but all the rest are gorgeous and that piece of wall art is something to dye for! I really like this, the fact it is so busy reminds me of living by the beach, the sounds of the waves, the smell of the salt and of the children playing, laughing and exploring rock pools. That main piece, the ceramic bead, is just out of this world it is gorgeous. What a stunning design! The focal is perfect and I love that you’ve added so much, it looks as though the sea has just swept in and left all of it’s treasure. Love the finish on the frame too! What a lovely and interesting piece you have made! So many details to stare at… the variety of colors, textures, etc is just yummy! I cannot get over how interesting and beautiful and how every time I look at it there is something new to see. It’s so amazing. I hope you have it hanging somewhere you can look at it all the time.